Really people… really? You’re going to come undone because this season, Major League Baseball (MLB) did away with the four-pitch intentional walk? Think about those half-hearted golf swings on short Par 3s or putts within 6-inches. Or basketball shots, like “free” throws that should be “gimmes” but aren’t. Heck, Annie told us about getting reprimanded for having a lazy back kick during her track workouts. “The clock doesn’t lie,” said her coach as he made her run a lap the right way — which just so happened to be 5 seconds faster than the previous lazy loop around the track. AWSI, Madson has a great point actually. Doc has spent a bit of time pondering the concept of nostalgia. 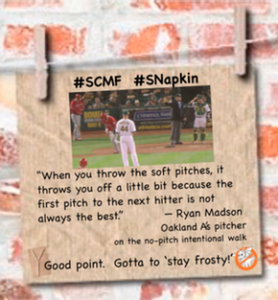 We say, let this season “play out.” Sure the no pitch walks isn’t a time saver per se, but it could do wonders for moving the game along if the pitcher maintains command of his fast ball, curve, change-up, etc.